Seven Pounds begins with a suicide. A man named Ben Thomas dials 911 and the operator confirms his location. When she asks him who the victim is, he replies, "I am." If this opening scene raises your interest, then you ought to see Seven Pounds, because the rest of the film incites just as much curiosity. The whole time we're watching it, we're intrigued by where it's taking us. The good news is that it pays off with earned and heartfelt emotion, but not until the very end. Most movies with any type of mystery often provide the audience with definite clues or action just to hold their interest and satiate their curiosity, but Seven Pounds engages us in such a way that we don't require answers right away. 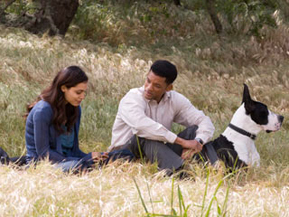 Here's what I can tell you: Ben Thomas (Will Smith) is an IRS agent living in Malibu. Based on a series of flashbacks, we learn Ben used to be an engineer and was once married to Sarah (Robinne Lee). Now he's single and lives alone. After coming back from a morning swim in the ocean, Ben calls a blind meat salesman named Ezra Turner (Woody Harrelson). He purposely insults Ezra in an attempt to infuriate him but has no such luck. Ezra just simply turns the other cheek and hangs up. Next, Ben visits a nursing home run by Stewart Goodman (Tim Kelleher), who's dying of cancer and heavily in debt with government. Somehow, he still manages to buy himself a shiny new Beemer. Ben talks with one of the old ladies at the home and asks her to tell him what kind of a man Stewart Goodman really is. Her answer is troubling. Ben then stops at a hospital where he meets Emily Posa (Rosario Dawson), a 20-something woman with congenital heart failure whose odds of living out the next six weeks are slim. She desperately needs a new heart but is considered too healthy to be put on the immediate donor's list. There are a total of seven good people Ben will encounter during his two-week journey. Along with Ezra and Emily, there's Connie (Elpidia Carrillo), a battered mother who's too scared to press charges against her abusive boyfriend; Holly (Juyann Elder), a friend of Ben's who put him in touch with Connie; George (Bill Smitrovich), a hockey coach who helps arrange college scholarships for poor high school kids; Nicholas (Quintin Kelley), a little boy in need of bone marrow; and Ben's brother (Michael Ealy), who keeps calling Ben and asking where he is.